There’s no big surprise here as LeBron James continues to be the best swingman on the planet – by far. Aside from him, there are three All-Stars on this list, but the one that’ll probably catch your attention is someone nearly everyone has forgotten – Jeff Green! Note: All of the following stats are based on the last five games of each player as computed by HoopsStats.com. Melo continues to play well enough to be in the MVP convo, but his Knicks haven’t exactly had the best February. NY has lost its last four games, including two against the Raptors – THE RAPTORS. This is the Jeff Green the Cs wanted when they traded Perk last season. He’s playing so well that Boston now has a new Big Three with him, KG and Pierce. I mean, look at his stats. He does everything. He scores. He rebounds. He blocks shots!!! He makes threes!!! And he makes those damn free throws!!! The Big Green are 7-3 this month, and Green (uh, yeah, pun intended) is the biggest reason why. 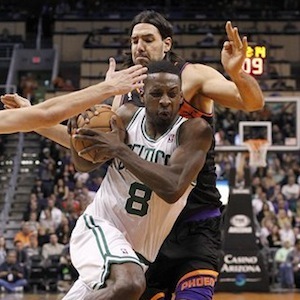 Jeff Green is back and better than ever! Get this. KD hasn’t scored fewer than 16 points this month, and, as you can see, he just does everything really well. His Thunder, however, haven’t been as amazing. OKC has lost 4 of its 9 games in February, including recent defeats to Utah, Miami, and Houston. This is proof that, if the Thunder want another shot at the Heat and the Larry O’Brien trophy, Durant will have to be more than just the best player on the team. He will need to be a championship-worthy leader. James’s February has been so good that NBA beat writers have been forced to dig up the best individual seasons of the past and put them side-by-side with LBJ’s. The only stat James “missed” is blocks, but with Chris Bosh doing a yeoman’s job down low, LeBron doesn’t have to worry too much about sending shots to the second row. Also, can anybody really get past him one on one? And I didn’t even mention his SIXTY FOUR PERCENT success rate from the floor. Huwaw Halimaw! Charlotte, NC (Sports Network) - Ty Lawson had 20 points, five assists and five rebounds in the Denver Nuggets' 113-99 victory over the Charlotte Bobcats. Andre Iguodala added 13 points and 10 assists, while JaVale McGee provided 17 points, six boards and three blocks off the bench for Denver, which snapped a four-game road losing streak. Kemba Walker netted 24 points to lead the Bobcats, who have dropped 11 of their last 14 contests. Orlando, FL (Sports Network) - Seven Cavalier players scored double-digits as the Cleveland Cavaliers defeated the Orlando Magic, 118-94, on Saturday at Amway Center. Marreese Speights led the team with 18 points and had eight boards for the Cavaliers, who won their second straight game. Alonzo Gee added 17 points while Tyler Zeller and C.J. Miles scored 16 points apiece. Kyrie Irving recorded 12 points and nine assists. Arron Afflalo scored 16 points for the Magic, who have lost five straight games. Tobias Harris and Beno Udrih, two of the players acquired from Milwaukee in exchange for J.J. Redick on Thursday, contributed off the bench. Harris had 14 points and six rebounds and Udrih recorded 10 points and seven assists. Washington, DC (Sports Network) - Emeka Okafor split a pair of free throws with 5.2 seconds remaining and Bradley Beal grabbed his missed second attempt, before also connecting on 1-of-2 foul shots, as the Washington Wizards earned a hard-fought, 105-103 decision over the Houston Rockets on Saturday. Beal paced Washington with 21 points to go along with four assists and five rebounds. Okafor added 17 points and 11 boards for the Wizards, who have won two straight over Western Conference foes and six of their last eight games overall. Trevor Ariza donated 18 points and dished out six helpers. James Harden scored a game-high 27 points and had six assists and three steals. Chandler Parsons netted 24 points, seven boards and five 3-pointers for the Rockets, who saw their two-game winning streak come to an end. Houston attempted 46 shots from behind the arc, connecting on 19, although Harden and Carlos Delfino combined to shoot a mere 7-of-23 from long distance in the setback. Auburn Hills, MI (Sports Network) - George Hill scored 17 points and Paul George had 12 points and 12 rebounds as the Indiana Pacers defeated the Detroit Pistons, 90-72, on Saturday at The Palace of Auburn Hills. David West had 16 points, eight rebounds and four assists for the Pacers, who defeated the Pistons for the second time in as many nights. Indiana won 114-82 on Friday in Indianapolis. Danny Granger made his season debut after being sidelined with a left knee injury and recorded two points and two rebounds off the bench. Will Bynum had a team-high 15 points but was ejected for striking Tyler Hansbrough in the groin in the fourth quarter. Jose Calderon added 13 points and Greg Monroe registered 12 points and 12 rebounds for the Pistons, who have lost three of their last four games. Philadelphia, PA (Sports Network) - Dwyane Wade had a game-high 33 points on 14-of-18 shooting from the field, while LeBron James registered a triple- double with 16 points, 10 rebounds and 11 assists, to push the Miami Heat past the Philadelphia 76ers, 114-90, on Saturday at Wells Fargo Center. 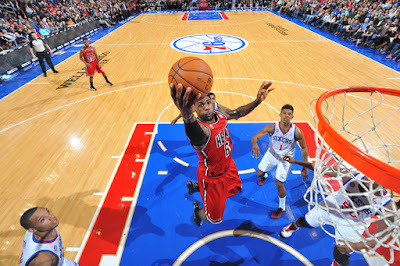 Mario Chalmers and Chris Bosh scored 14 and 13 points, respectively, in the victory, which was the Heat's 10th straight. It was also the 12th straight victory in their series versus Philadelphia and sixth straight in the City of Brotherly Love. Jrue Holiday paced Philadelphia with 21 points to go along with six rebounds and six assists for the Sixers, who have lost four straight. Nick Young netted 19 points and Evan Turner had 16 points, seven rebounds and five helpers in the defeat. LeBron James has taken the whole plante to school this month! Milwaukee, WI (Sports Network) - Al Horford scored the go-ahead basket with 5.9 seconds remaining, capping a fourth-quarter comeback that lifted the Atlanta Hawks to a 103-102 decision over the Milwaukee Bucks from the Bradley Center. Both Horford and Jeff Teague finished with 23 points for the Hawks, who trailed by 10 points with 6 1/2 minutes remaining before outscoring Milwaukee by a 20-9 margin the rest of the way. Horford added 11 rebounds on the night, and Atlanta also received big efforts from Devin Harris and Josh Smith to notch its fourth victory in five games. Harris poured in 21 points on 7-of-11 shooting, with Smith pulling down 13 rebounds to go along with 15 points. J.J. Redick scored 16 points in his Milwaukee debut, but the trade-deadline acquisition's presence wasn't quite enough to prevent the slumping Bucks from a third straight defeat and seventh setback in their last eight tilts. Ersan Ilyasova paced Milwaukee with 19 points, with Larry Sanders amassing 12 points and 19 rebounds in a losing cause. Los Angeles, CA (Sports Network) - It's been an unprecedented season thus far for the normally-lowly Los Angeles Clippers franchise. And the Clippers keep establishing new milestones. Caron Butler had 21 points and the Clippers tallied their first season sweep of the Utah Jazz in 34 years and reached 40 wins the quickest in franchise history with a 107-94 triumph. Blake Griffin totaled 18 points and seven rebounds, Lamar Odom chipped in 18 points and Chris Paul added 11 points, seven assists and seven boards for the Clippers, who hadn't swept the season series against the Jazz since 1978-79. Gordon Hayward finished with 23 points and eight rebounds for Utah, which had its three-game winning streak snapped. The Jazz were 1-of-15 from beyond the arc. Interesting choice of Jeff Green > Carmelo Anthony. Although I agree 100%, I never thought I'd see it in any sports articles.